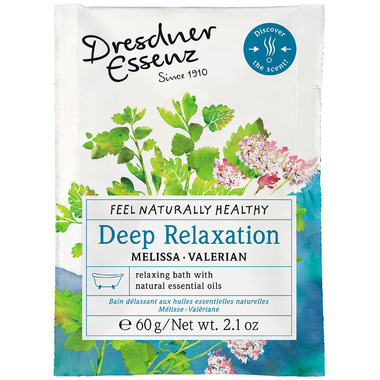 Dresdner Essenz Deep Relaxation Bath With Natural Essential Oils is a beneficial bath essence with active essential oils melissa, lavender, and valerian. The harmonizing power of lavender refreshes you when exhausted and relaxes you when busy and stressed. The melissa oil helps you to rediscover your inner harmony and peace of mind. The sesame oil combined with panthenol gives your skin a silkiness you can feel. This is the perfect care regime. Ingredients: Maris Sal (Sea Salt), Silica, Solanum Tuberosum (Potato) Starch, Sodium Methyl Oleoyl Taurate, Sodium Chloride, Lavandula Angustifolia (Lavender) Oil, Sesamum Indicum (Sesame) Seed Oil, Cymbopogon Winterianus (Citronella) Herb Oil, Panthenol, Caprylyl/Capryl Glucoside, Hydrolyzed Wheat Protein, Cymbopogon Martini (Palmarosa) Oil, Melissa Officinalis (Balmint) Leaf Extract, Valeriana Officinalis (Valerian) Root Oil, Aqua (Water), Citric Acid, Citral, Geraniol, Citral, Linalool, Citronellol, Lemonene, CI 17200 (D&C Red 33), CI 42090 (FD&C Blue 1). Directions for Use: Empty contents into the running bath water and stir thoroughly. Recommended bath temperature of 36 - 38 degrees celcius. Recommended bath time for about 10-20 minutes. For External Use Only. Do not bring bath essence into contact with mucous membranes or eyes. Keep out of reach of children. Not suitable for children under 3 years of age. Best product ever! All of their bath products are completely worth every penny!